Christian metal outfit STRYPER were never on my hotlist back in the day. Their yellow and black spandex and Christian bible waiving didn´t go down well at the time. To their credit they soldiered on from 1983, took a break during most of the nineties, returned/resurrected and even more so in 2011 when original bass player Timothy Gaines also joined in. 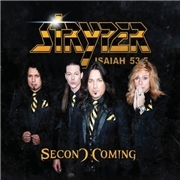 Since the release their 2011 covers album the original lineup of Timothy, vocalist Michael Sweet, guitarist Oz Fox and drummer Robert Sweet are back in action. This is a collection of songs from their first EP, or the two first full-length albums. “Loud n´Clear” opens up the proceedings. The classic eighties hard rock feeling is there, and the STYRPER chorus trademark. “Loving You” is more of the same, only less inspired. But I have to admit to becoming quite partial to their classics, there is something more to songs like “Soldiers Under Comand” and “To Hell with the Devil”! But their formula of mixing almost BEEGEES like choruses with riffs as if invented by JAKE E LEE works for many more tracks. “The Rock that Makes Me Roll” fares especially well, but the style of “Free”, “The Way” and “Sing Along Song” is most enjoyable too. But admittedly the pure adolescence of “Loving You” And “Surrender” shows that the band was young and reckless at the time. But with a modern overhaul the lion part of the songs are lifted. The ending of the sixteen tracks also includes two new numbers, “Bleeding from Inside Out” and “Blackened”. I take it these are temperature measurers as they are quite different. The more modern first mentioned track is groovy but doesn´t really stand a chance against the retro tinged “Blackened”. The refrain, their typical chorus, everything works. So...stick to your guns this time lads, there is no grunge around to spoil the fun, only fans to be kept happy!